After the presentations during the Open Studios event on Monday at Nida art colony, we discussed each others works informally with smoked fish and beer or wine. Prompted by the comments I received I realised that I very easily succumb to a form of vanity, creating romantic imagery where the human figure looks good and the atmosphere is somehow semi-sublime. 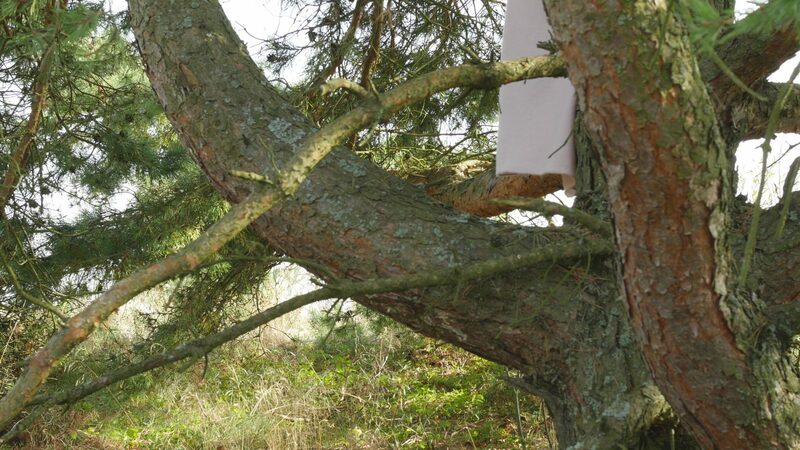 This was particularly true for the work I showed, Sunday with a Pine, which is recorded from a middle distance. My previous attempts, especially Resting with a Pine 4, 5 and 6 are much less flattering for the performer, but also less pleasing as views, and perhaps less interesting, too, because they do not “flirt” with the problematic tradition of the “sublime” landscape. I was nevertheless irritated by the idea of letting my vanity influence the images, and decided to make one more attempt. 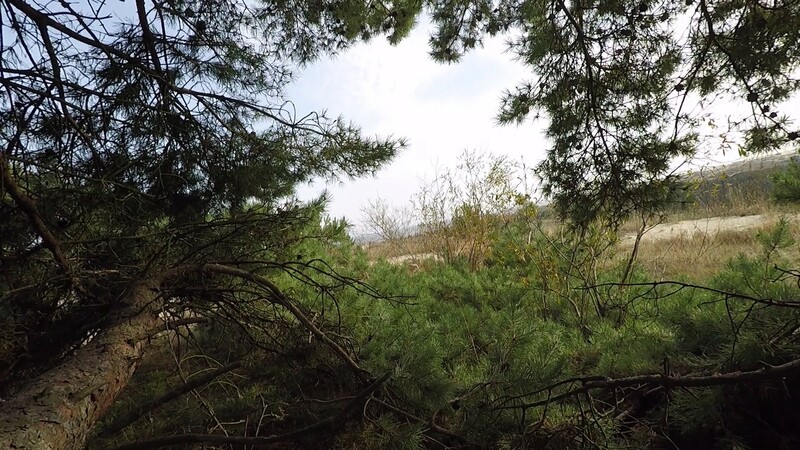 On Tuesday afternoon I climbed up to the dunes and looked for a suitable pine that would stand relatively alone, so I could have an image of it from a distance without other branches hindering the view. And of course I wanted to find one I could easily climb on and not be completely covered by the needles. I chose one near the open dunes and tried to find the right angle for the camera with regard to the sun. 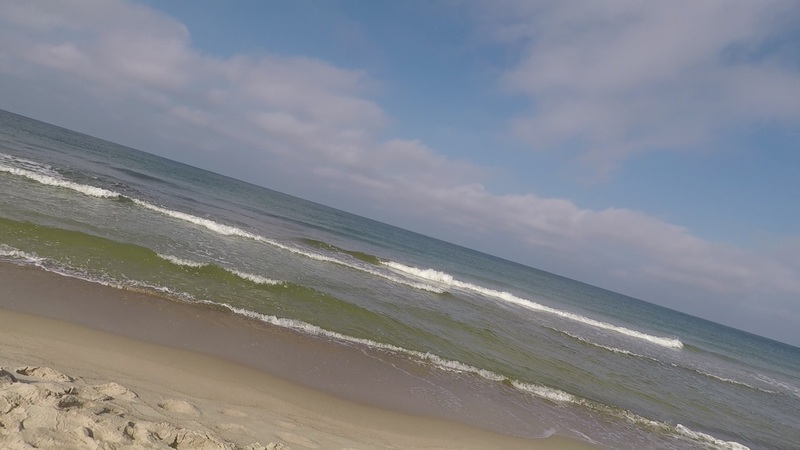 I had also brought with me my go pro, and wanted to experiment with recording the view from where I sat in the tree with that camera while my main camera on the tripod would record the whole scene. I made four attempts with the tripod placed at various distances. 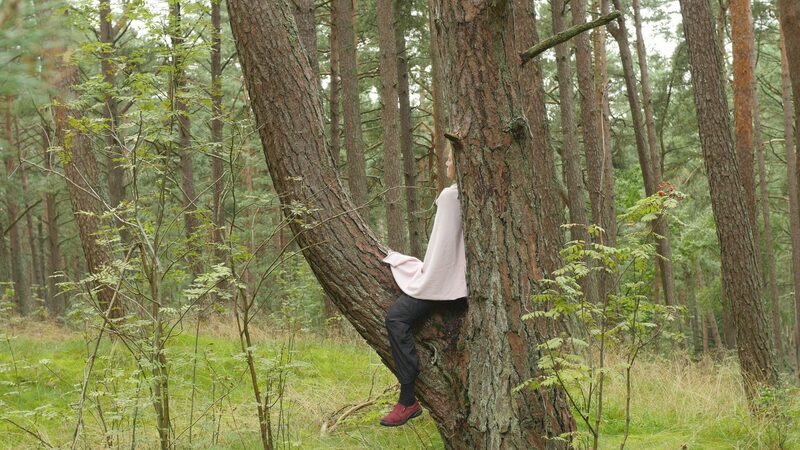 The two first ones are in close up, resembling the work called Year of the Dog – Sitting in a Tree (2007), where I was sitting in a pine on Harakka Island once a week for a year (2006-2007) with only my shoulder visible in the image. The first one is actually too dark, almost in backlight, but there you can see something of the landscape below. The third one is about as far as I could get without bumping into another tree and shows the pine in full. The fourth image is something of a compromise, from a distance, but closer, so you can see the human figure more clearly. It is perhaps closer to a romantic version again. Resting with a Pine 9-12 are all online, too. 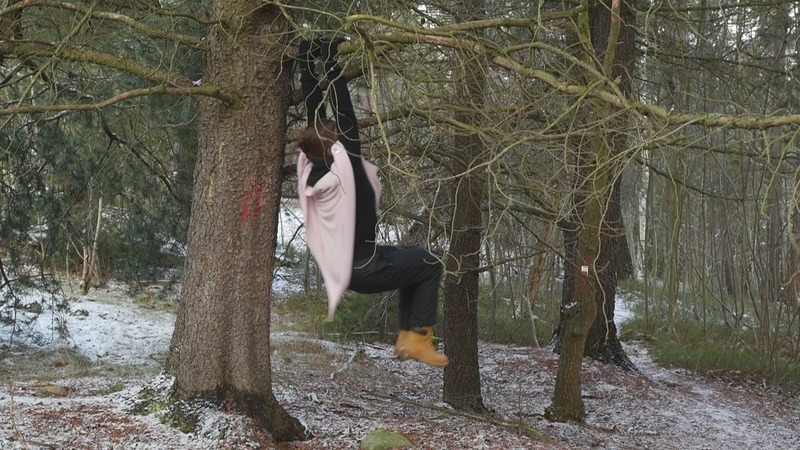 The go pro images from the four variations look almost the same: I had the camera in my hand while sitting in the pine, and although I tried to stay immobile there is small movement all the time. They are ok as still images, even though the horizon is leaning one way or the other and you cannot see so much of the view in them either. 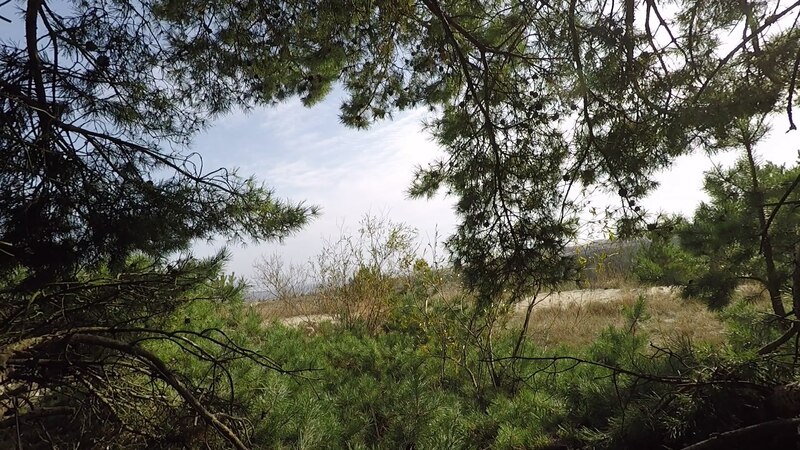 Today on Sunday 24 September I finally decided to visit one of the pine trees up on the dunes every two-hours for a day, creating a time-lapse video in the manner I have done in other places. I decided to start at eight in the morning, after sunrise, and finish at eight at night, after sunset. And here I intend to write some notes of each session. So, it is time to begin…. First image. Fresh morning, quiet, empty parking lot on the hill (one car that has stayed there from yesterday), the parasols of the souvenir stands all tight and shut. I am early; finding the spot for the camera tripod is easy, framing the image is relatively easy, too. The sun is only a yellow colouring in the east, showing only as a vague glow on the tree trunk. 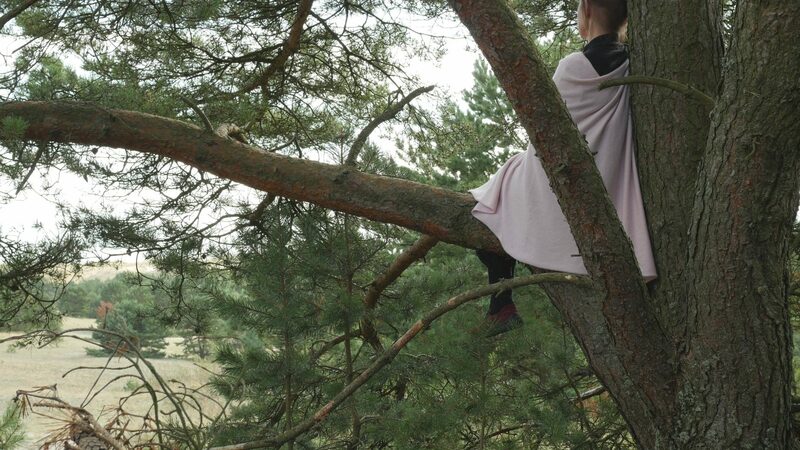 It is quarter to eight, I climb up in the tree and sit there for approximately five minutes, enjoying the silence and the wind. Then climbing down, packing my things and returning downhill to the colony. The rays of the sun are turning brighter behind the trees. Quarter to ten, the first bus stands on the parking lot, with a few cars around; all the souvenir stalls are up. A couple with bicycles rests on the bench by the road on the way up. The sun is high, brightening the surroundings. Suddenly the yellow leaves in the small birches stand out. 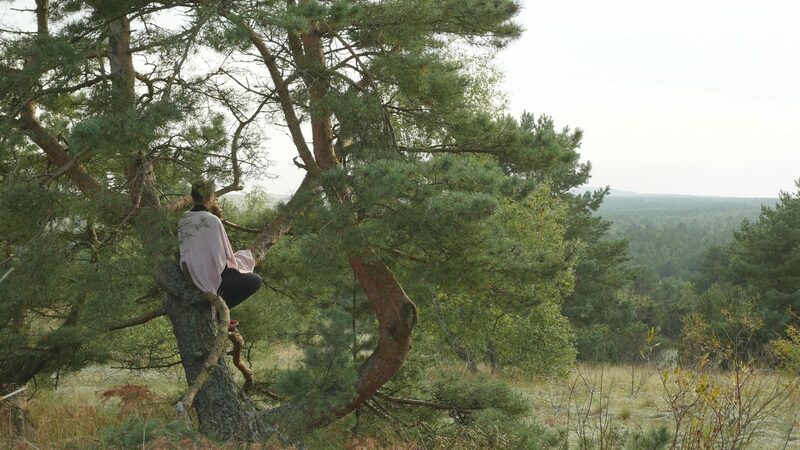 I repeat my routine – second time and it is already a routine – sit in the tree and enjoy the view. I am aware of cramping my thighs around the branch unnecessarily, but if I try to relax I immediately feel unstable. The sun is not really warm and there is a chilly wind from the east; the morning is still, fresh and new. Quarter to twelve, noon, and sun shine. It is warm, now. The bus is gone, replaced by lots of private cars; I can hear the car doors banging while sitting in the pine. An ant is moving towards me on the branch, I hope it finds a way around me, and choose not to wipe it away. I have learned how to get up on the branch and how to get down with relative ease, but I still have not found a way to sit comfortably. What feels OK to begin with soon becomes uncomfortable, and I do not want to move in the image. After all, I am sitting there only five minutes at a time. Quarter to four, almost hot, lots of traffic. The guy selling souvenirs closest to the slope looks at me with suspicion; why is she here again? Or then I am the suspicious one. The sun is no longer above me, but luckily not straight in my face either, or in the face of the camera, that is. Only two more sessions after this one; time passes so quickly it is almost scary. The walk up and down the slope feels like nothing, especially the walk down the slope, except for the constant stream of cars and huge coaches. I uploaded the clips on my computer and tried to combine the ones recorded so far. The image jumps quite a lot between each session, probably because the tripod sinks into the sand a little different each time. Quarter to six, evening is approaching. In the forest below the hill it is already chilly, although the sun is still high in the sky when viewed from the dunes. It is hard to believe that it will set in less than two hours. There are no more coaches in the parking lot, one came down while I was on my way up the hill. Most of the souvenir stalls have closed, but there are plenty of private cars still. The pine looks really beautiful in the evening sun. This was the next to last session; the last one will be right after sun set and I am already worried that it will be too dark, for the camera to record anything and for me to find my way back. But for now everything is glowing bright and beautiful with warm evening colours. Quarter to eight, after sunset, or actually a few minutes before, I guess, because I hurried up the hill, scared of the approaching darkness. But no problem, the light lingers on and up among the dunes the sand reflects the light, too. There were two cars left on the hill, and while returning down I still had no need for a torch. The view from the pine, with a pale violet sky and a thin crescent moon was so beautiful; what a pity that the camera sees it so very differently. I had to make all possible adjustments to let it record something, and it did. So now my Sunday with the pine is over, and it passed so very, very quickly. 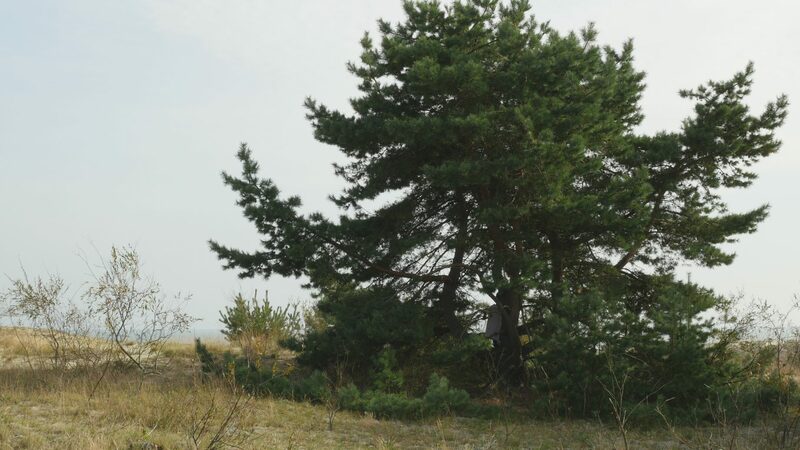 Yesterday I returned to the dunes where I saw the first pines with strong and spread out branches suitable to sit on, and found more than enough of possible partners. The pines look special because they grow individually and not in thickets as further up on the spit and they spread out their lowest branches on top of the sand, as if to keep it there, under their skirt hem as it were. I tried to find ones that would let some of the view to be seen through their needles, and to have the light in a nice angle. The first one is taken with the camera on the slope so it looks like I would be sitting very low. The two others are taken with the camera below, but a little bit too close. The human figure is again fairly large compared to the tree. In any case I edited the material into three small videos, and added them to the RC together with the previous ones, here. 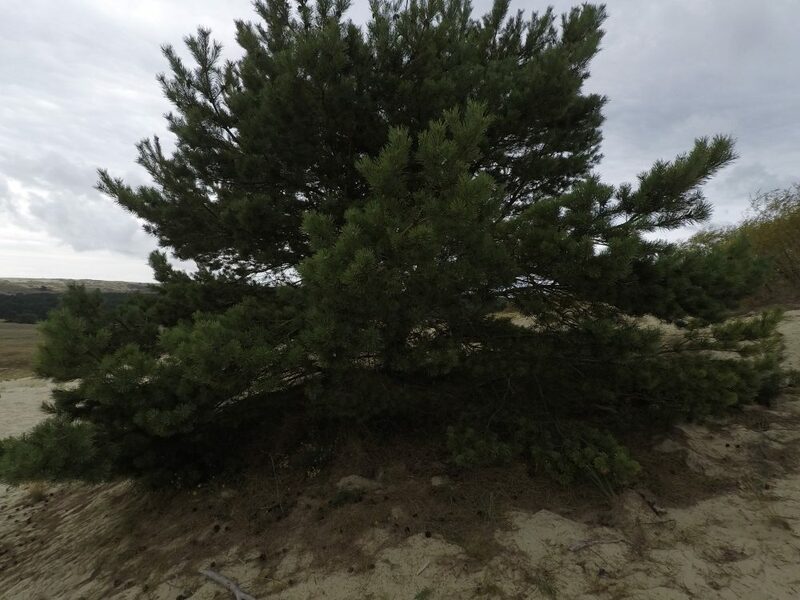 These pines on the dunes where nevertheless relatively easy to capture in landscape format images compared to the pine I ran into the day before, on 12 September. 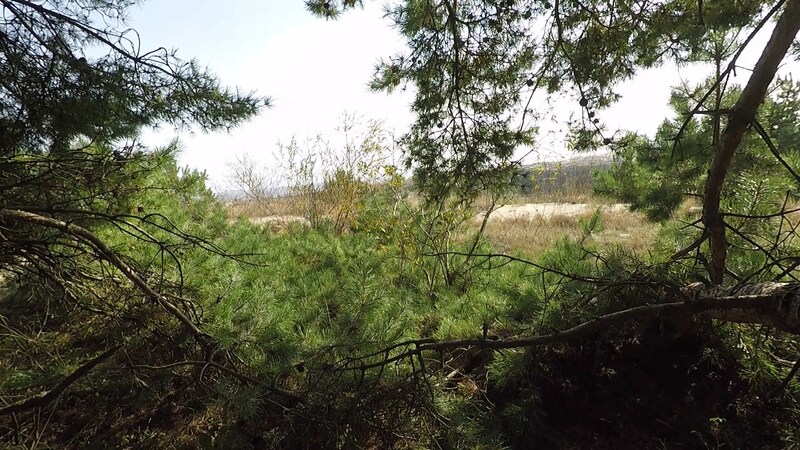 After a rather long walk on the forest paths north of the colony I suddenly saw a pine tree by the path which looked inviting, because it was divided in two fairly close to the ground. It turned out to be somewhat of an illusion, though, and not so easy to climb up to. 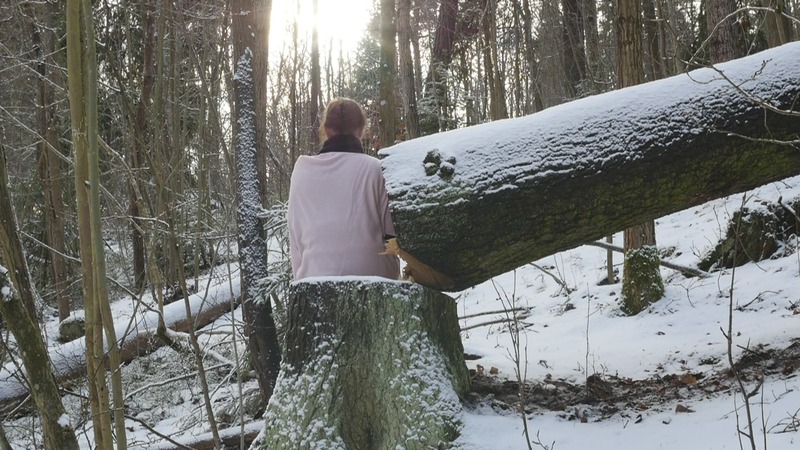 But I finally managed to straddle it, like a horse, and sit there leaning against the wet trunk for a while. Exploring movement has been my main challenge during this week in Nida, because I brought with me my small action camera that I have not used at all, in order to start familiarizing myself with it. A few days now I have been walking on the straight paths that cross the forest south of the main road and today I made the first experiments editing the material. After some unnecessary half-fabricated stuff that took ages to export, I finally tried to put all the images in one frame. The longest sequence, which was actually the last one, from today, served as the basic image with sound, and five others were inserted as small frames within it. And because they were all of different length I simply took as much as was needed from the beginning and added it to the end. So instead of speeding up the material, a sense of speed or action is created by several simultaneous images. The eyes are jumping from one small frame to the next, without being able to follow them all, a kind of speed that too. But the five small frames within the larger frame also form a decorative pattern, where the individual images lose their importance. I uploaded a very small file of the work on the research catalogue, here. Well, it is perhaps not so exciting or interesting, or anything new, but at least it is something I have not done before. The problem of the moving camera, the moving image, literally, is not solved by these experiments, though. I have been interested in the small movements generated by the wind, the waves, the clouds crossing the sun and so on, registered by a static camera, so why could not the movement of the camera be minimal as well? What if I walk really slowly, trying to keep the camera movement as minimal as possible? Or perhaps I should simply stand or sit and see if my breath will show as movement? Or perhaps record the view to the side, like looking out of the window of a train or car? 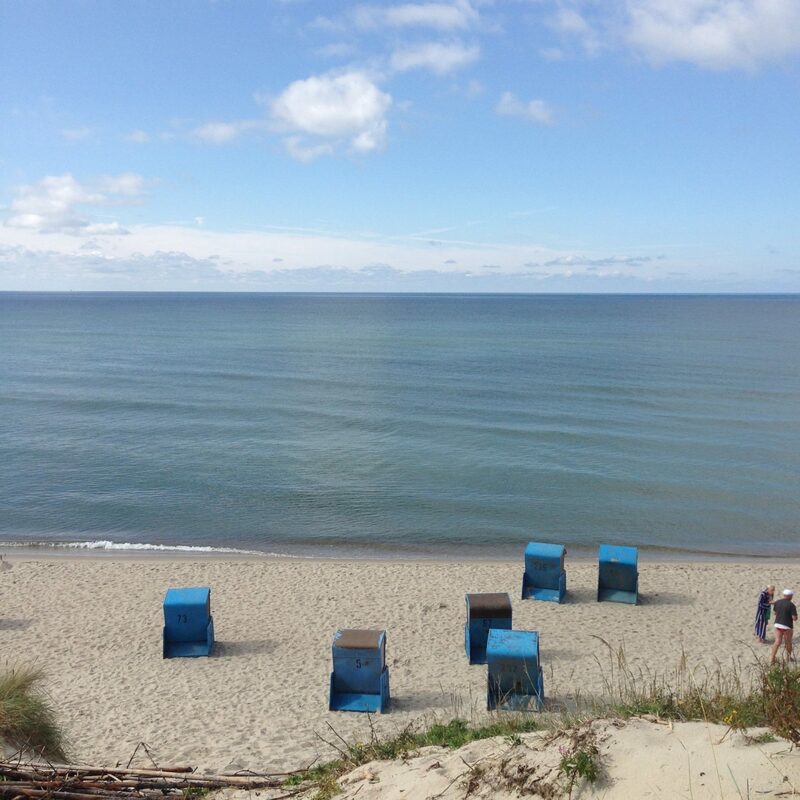 – I tried that by the beach this morning, and this is the result, a horizon in diagonal! 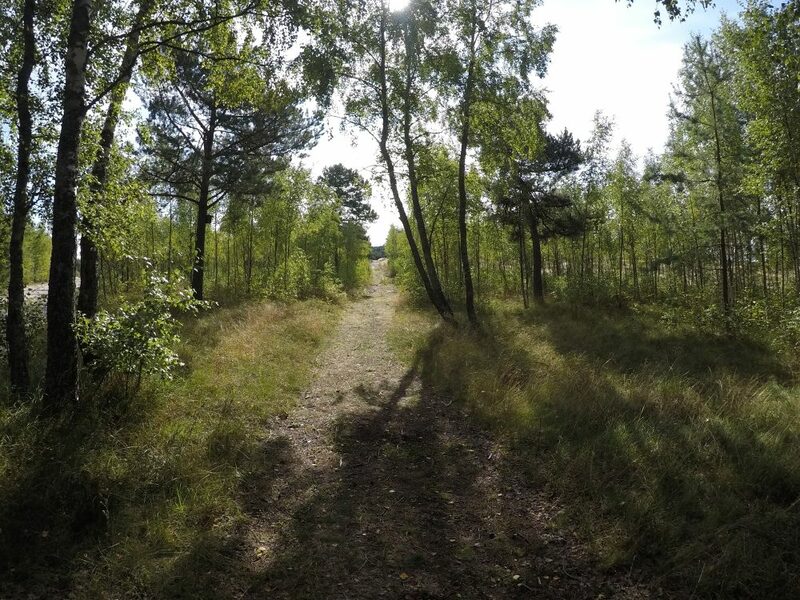 The same phenomenon, my gaze turning my head downwards, probably, is visible also when walking on the forest path up from the beach (see image at the top). Obviously some more experiments and adjustments are needed…. 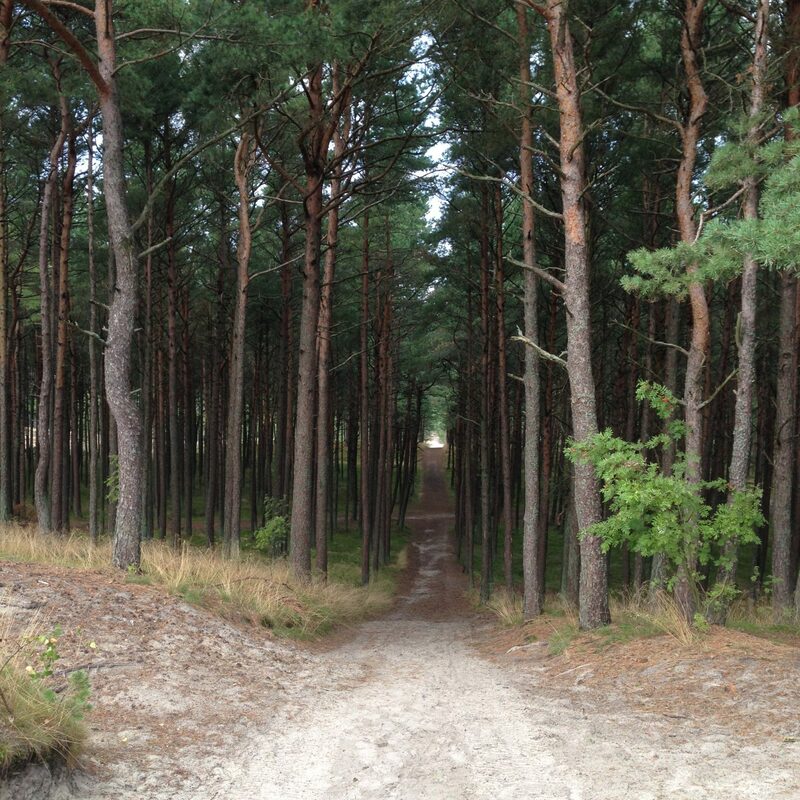 After a few days of walking back and forth on the sandy forest paths on the pine-covered dunes of Nida I have realized that in contrast to the usual proverb, I cannot see the trees for the forest. 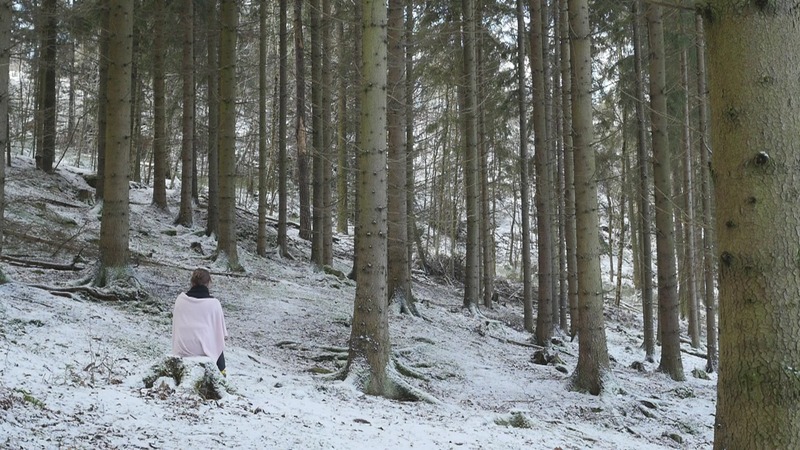 Today I found a pine growing on the slopes toward the sea that I could somehow make myself sit in, (see image below) and another one bent so low in the forest north of the main road that it could be quite comfortable to sit on. 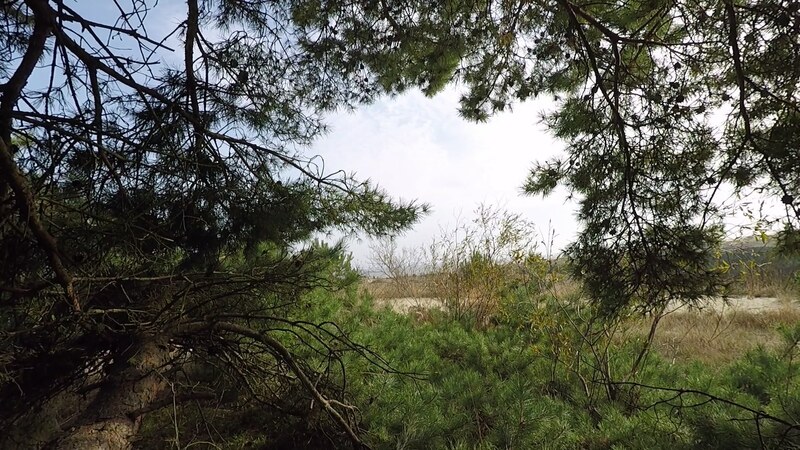 (See image above) Something in the environment suggest moving on the paths rather than sitting in one place, so I played with my little Gopro action camera and tried to see what could be done with it. At first I walked with the camera in my hand and tried to record the shifting quality of the ground while walking. That did not look interesting and the movement was rather disturbing actually. I tried my head-gear instead, a strap to hold the camera like a head lamp. After a few attempts I found an angle that resembled normal eyesight, although walking made the movement slightly bumpy and thus confusing. Am I so accustomed to smoothly gliding cameras in Hollywood movies that everything else makes me dizzy? When I looked at the material it was enjoyable when speeded up ten times, a sports documentary quality artificially created. An action camera is fun, yes, but if you are not engaged in very energetic action, then what to do with it? And how can you perform with or for a moving camera. The whole idea of using a camera on tripod has been to be able to step in front of the camera, too. But how to do that with movement? A camera on tripod is necessarily static. If I attach the camera on my moving body the resulting image is necessarily unstable and bewildering. My initial idea was to combine the two, to walk on the path with an action camera while my old camera would record the walk from a distance. Perhaps I will, try that out tomorrow…. hm. Today I walked with my action camera again, up and down two of the paths, but was not very impressed by the result. Perhaps I should combine all these walks on one screen, as small squares inserted into one image? The forest is full of pine trees, all fairly straight and tall, or then small mountain pines that form impenetrable thickets. 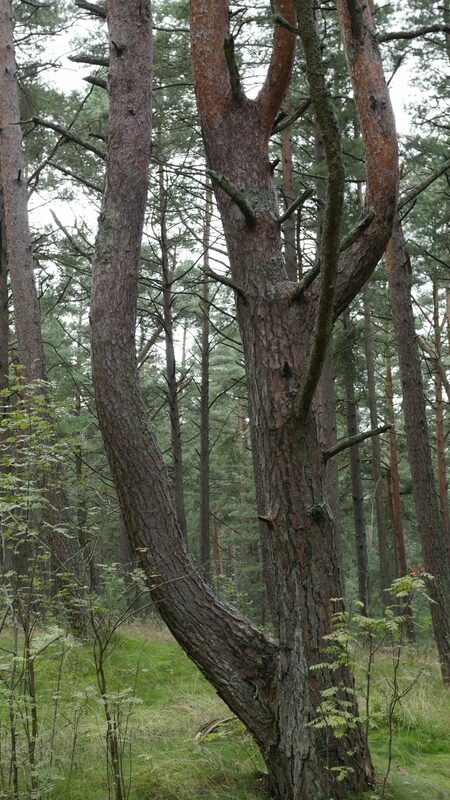 Finding a suitable partner is not an easy matter, so I decided to return to the pine with the branches bending low that I saw yesterday and to try to make a session with it. 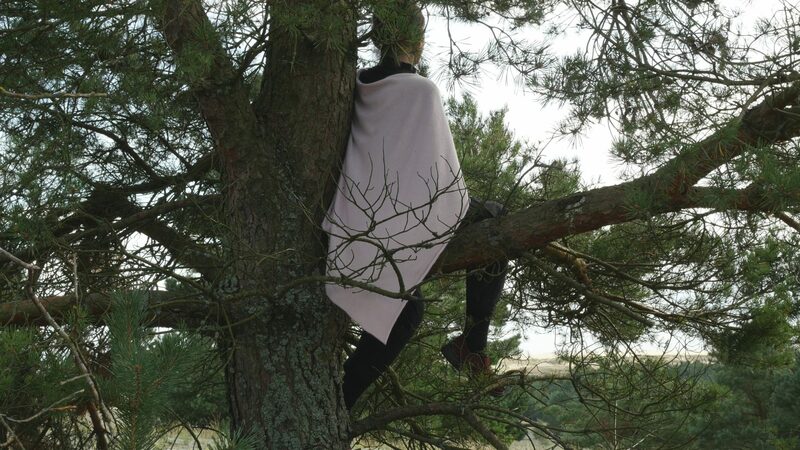 In the afternoon I changed to my black “performance outfit”, took my camera, tripod and scarf, and set out to find the pine. The pine was near to the path, so finding it was no problem. Finding an interesting viewpoint or camera angle was more difficult. I wanted to avoid possible passers-by on the path and to find a reasonably stable point for the tripod. In the end I found two ways of framing the image that were somehow interesting. The first one with the pine branches in close up covering the whole upper part of the image and the second one with the sculptural shape of the branches crossing each other. I sat for approximately ten minutes for each image and was rather lucky in having that part of the forest for myself for a while. When I looked at the material and edited the short videos, I found the second one less interesting, although the branches cross each other in a peculiar way; perhaps because my face is visible, when I am sitting in profile. The first one is quite beautiful actually, because the camera focuses on the pine needles in the foreground and the human figure in the background remains soft and unfocused, a vague shape. 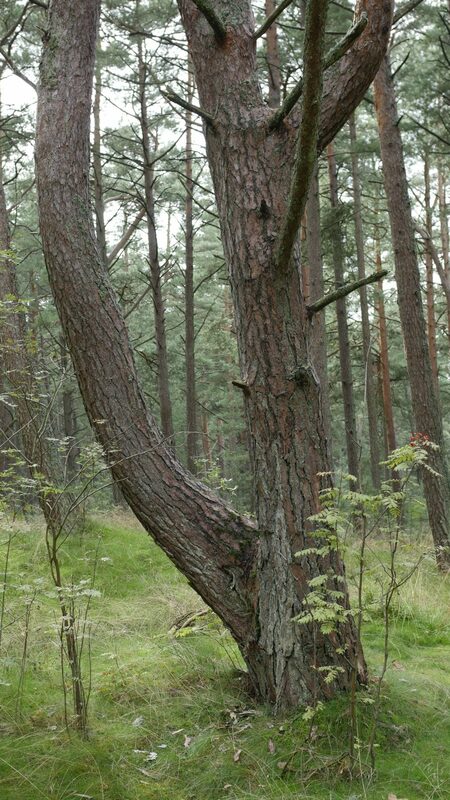 The image is very romantic in some way, but at least a little different from my other sittings in trees. So now I have something to show for my first week in Nida! I will continue playing with the action camera, however, because I want to try something different. These small videos I called “Resting with a Pine” and that is exactly what they are about. But what about the action? Vilnius airport is rather close to the actual centre of Europe, they say, although from my point of view its is rather far in the east, which relates to the fact that it is the eastern border of the European Union, which is of course something else than the geographical “continent”. I tend to forget that Russia has a large European part, in the same way as people living further south in Europe tend to forget the actual extent of the territories of the nordic countries. On the north-south axis the centre of Europe is somewhere in southern Sweden (Karlskrona). This is my first trip to Lithuania, and only this morning did I realize that I can use euros here. 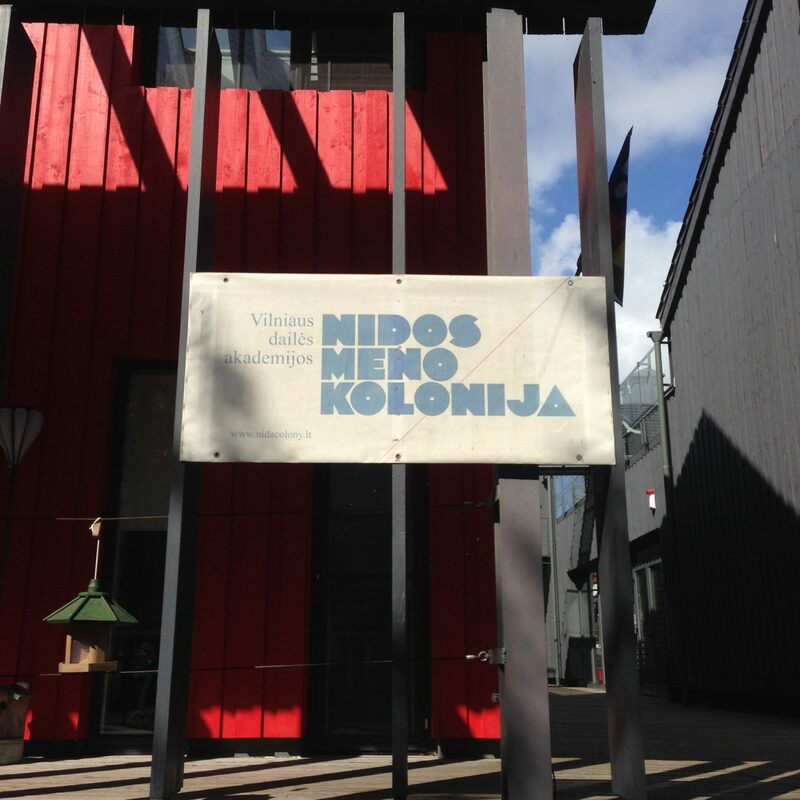 The reason for my trip is a short residency at Nida Art Colony at the coast, in what used to be called Courland, on the narrow strip of land crossing over the bay, the Curonian Spit, actually rather near to the Russian border and Kaliningrad. It sounds exotic and exciting. My first stop, Vilnius Airport, was fairly ordinary. Some form of pastry filled with chicken (yes?!) tasted rather Russian, but perhaps it is one of my prejudices, too. Or a situation resembling the weird similarity of greek coffee and turkish coffee, despite all the differences. 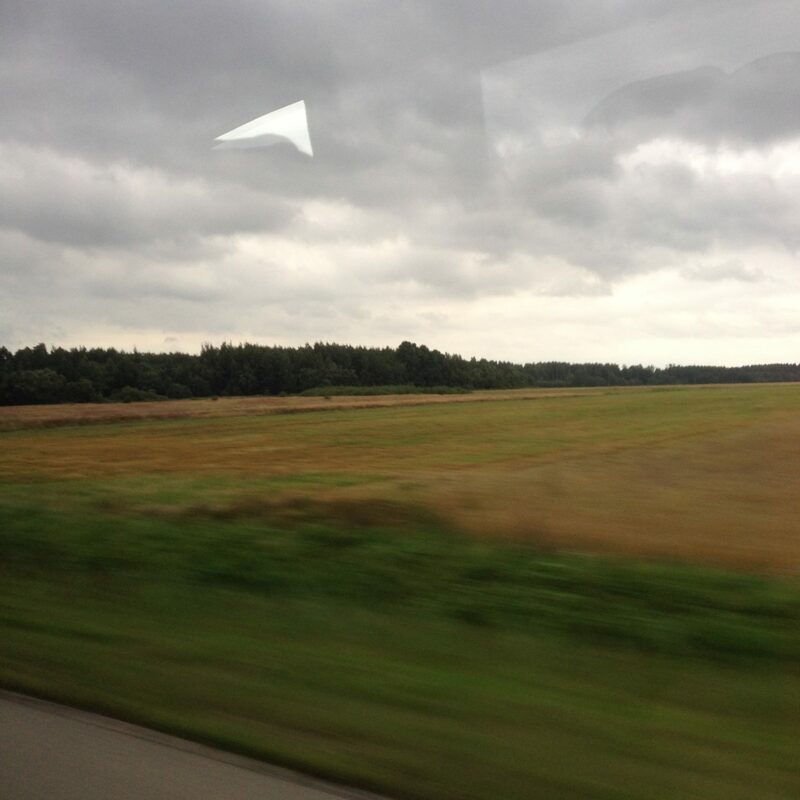 And now the shuttle bus is moving, heading towards Kaunas first, and then the next stop, Klaipeda! Well, actually I am sitting in Smilthyne now. Klaipeda passed quickly, because there was a cab with my name on a paper in the window right where the shuttle bus parked, so I just transferred my bag from one car to the next. A silent oldish and rather fat man drove me to the harbour and charged 4 euro for it, which is decent, I suppose. And the ferry ticket, which I managed to purchase, despite placing one euro in the wrong place first, where it got stuck, but anyway, granted me access to the ferry which was to leave in five minutes. I remember from the travel plan that I was to take the ferry at six, and the bus at ten past six, but it felt stupid not to go on the ferry, since the opposite shore looked so much nicer. Well, it looked nicer, but everything was closed, because it is off-season, of course. So I started following the signs, walking along the shore, after finding the bus stop and confirming the time-table. And after dragging my bag for a while along the flat shore – everything seems rather flat around here – I found this harbour cafe that is open, with a few clients, and enjoyed a bruschetta with gorgonzola, fig jam and a slice of pear with my tea. Not bad. I can imagine this as a real tourist paradise in summer months. They say it has been popular especially with germans since the beginning of last century. Anyway: Next stop Nida! After spending two days in Nida, meeting the other artists-in-residence, enjoying a meal and sauna together, I have been walking in the forest, among the dunes, between the sea and the lagoon, looking for special trees. But they are all beautiful and fairly similar. So far I have not been able to see the trees for the forest. Fortunately there is still time….